The wreckage of a fatal crash outside of Tisdale, Sask., is seen on April, 7, 2018. The roads meet in a near-perfect cross, straight lines intersecting in the vast patchwork of Saskatchewan prairie; Highway 335 stretching east to west between Gronlid and Arborfield, Highway 35 running north to south from Nipawin to Tisdale. At 5 p.m. on Friday, the intersection was cold, sunny and bright. The Humboldt Broncos bus was moving north with 29 people on board, the semi-trailer heading west, its lone driver carrying a load of peat moss to Alberta. The intersection already bore a line of white crosses, marking six lives lost there in a crash 21 years ago. What caused the bus and the semi to collide in the intersection on late Friday afternoon is not yet clear, and will be the subject of extensive investigation in the days, weeks and perhaps months to come. News photographs show both vehicles obliterated by the impact, the bus torn open and emptied like a shell, the semi on its side, its cab somewhat intact but its body twisted, the packaged cubes of peat moss it had been carrying scattered far into the fields. The bus, travelling north, would have had the right of way; the semi, a stop sign. 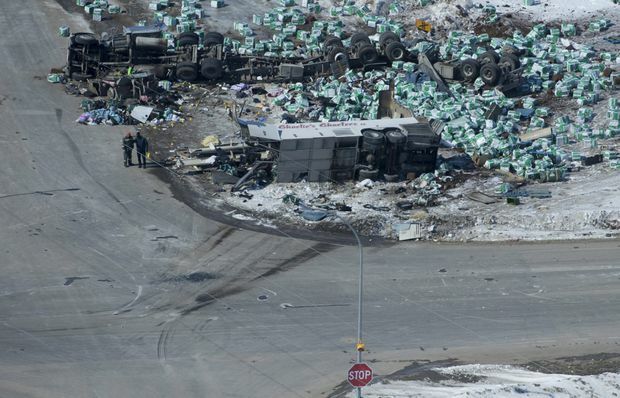 Saskatchewan RCMP Assistant Commissioner Curtis Zablocki said at a weekend press conference that it was too early to comment on the cause of the collision, or know if any charges could be considered. Assistant Commissioner Zablocki said the driver was not injured, and was provided “mental health and wellness assistance” after the crash. Kim Calfas, a retired police officer and collision reconstructionist in Regina, said investigators have a huge and complex task before them as they work to determine what happened. He said investigators will examine all of the factors and circumstances leading up to the crash, considering everything from the weight and speed of the vehicles, to the surface of the roadway, the position of the sun, and the vitally important “human factor,” which could be anything from a moment of inattention to a medical or impairment issue, or a simple mistake. Lloyd Staples, a farmer who has lived a kilometre south of the intersection for 44 years, says he’s seen people run through it many times, though the intersection marked with flashing stop signs and lit at night. He speculates there’s too much going on, with two train crossings, the road to the Cargill grain depot, foliage near the highway in one spot, and the meeting of two very busy highways. Ian Boxall, who lives about 8 kilometers from the scene and is a councillor with the rural municipality, said he’ll be lobbying for changes at the intersection. “I don’t know if it’s going to require lighting and signs further back or what, but obviously it needs something,” he said. On Sunday morning, the RCMP reopened the Armley Corner intersection to traffic. Officers were the first to lay flowers, a spray of vivid yellow beside the intersection of two Saskatchewan highways, meeting like a cross in the midst of a vast prairie.